On March 14th, the awarding ceremony of the Huilin Prize for Culture has been held grandly. The prize is named after Mr. Huang Huilin, who is a senior professor of Beijing Normal University and the head of the Academy for International Communication of Chinese Culture. 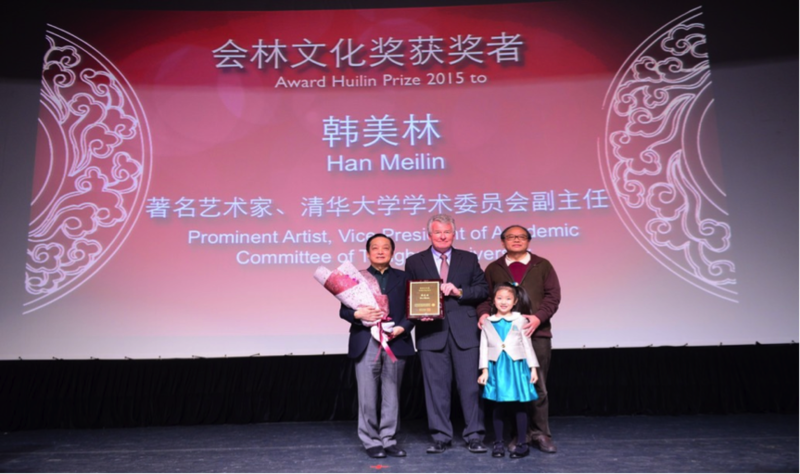 Swedish sinologist Torbjörn Lodén and the famous artist Han Meilin shared the 2015 annual Huilin Prize for Culture. And Patrick J.McGovern, the founder of International Date Group, was awarded the Prize for Special Contribution. The ceremony was hosted by Yu Dan, a professor of BNU and a renowned scholar. And Chuansheng Liu, the Party Secretary of BNU, has made a speech on it, and she believed that the prize was helpful for the international communication of Chinese culture, of which the core was to promote Third Pole Culture. The Huilin Prize for Culture, an internationally oriented academy award, is hosted by the Huilin Cultural Fund of BNU and the Academy for International Communication of Chinese Culture; it aims to honor both Chinese and foreigners who have made outstanding contributions to international communication of Chinese culture. 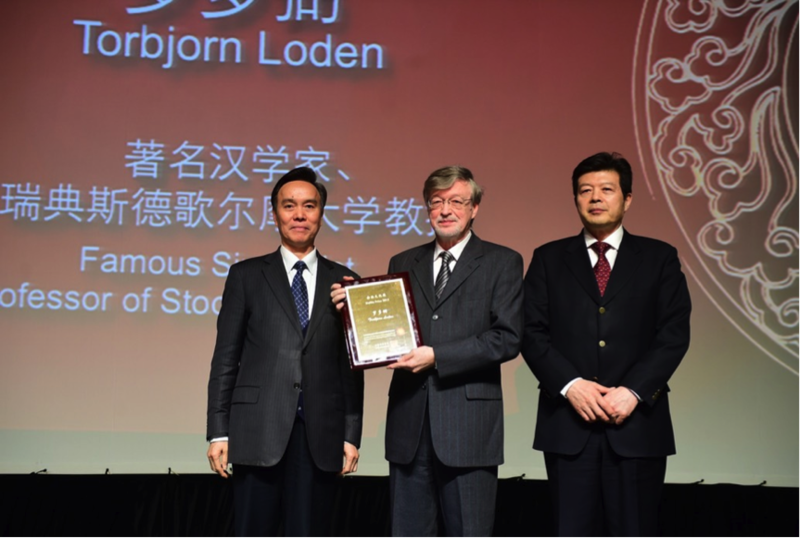 Long Xinmin, a member of the CPPCC Committee, presented the award for Torbjörn Lodén. And Qi Mingqiu, the party secretary and executive vice president of China Soong Qing Ling Foundation, read the presentation words, in which he declared that Torbjörn Lodén has made great achievements in translating the Four Books and studying the thought of Dai Zhen, and he is one of the representatives of European sinologist. Torbjörn Lodén said in his acceptance speech that Chinese and Western culture shared a lot of themes and diverse variations, and restoring traditional Chinese culture was now a significant trend, but it should in no way cause the opposition of Chinese and Western culture, and we should retain the essence and remove the dross of both cultures. He paid great attention to the three aspects of traditional Chinese culture: Confucian affirmation of people, Taoist respect for differences and freedom, and China's unique aesthetics. At last, he said he was honored to be awarded the prize, and he would go on working hard for promoting the communication of Chinese and Western culture, and progressing mutual understanding and trust of the two cultures. Roger T.Ames, professor of the Department of Philosophy, University of Hawaii, and the director of the Asian Development Project of University of Hawaii and the US East-West Center, presented the award for Han Meilin. Zhong Chengxiang, the librarian of Central Research Institute of culture and history and Chairman of the China Association of literary critics, read the presentation speech. He declared that Han Meilin has combined the essence of Chinese traditional art with modern international aesthetic sense, proficiently used Eastern and Western art language, and has achieved remarkable results in different categories such as painting, calligraphy, design, sculpture, ceramics, paper cutting, and Mr. Han is one of China's most influential international artists. Han Meilin said in the acceptance speech that traditional Chinese culture should be treated objectively. And the Chinese nation is a nation with a great culture, and Chinese artists should not only guide behaviors with traditional Chinese culture but to think of it from the point of view of all human beings. In the era of globalization, Chinese artists still need to emphasize individuality, independence, and nationality, and only in this way can they form a unique personal style. Professor Roger T.Ames made a speech on behalf of the final assessment judges of the prize, and he indicated in his speech that human beings are facing a common crisis in the era of globalization, and it is the traditional Chinese thought of "relationship-based" knowledge and Confucian values that will be the important source to solve this crisis. Patrick J.McGovern, the founder of IDG and also the honorary chairman and one of the donors of Academy for International Communication of Chinese Culture, was awarded the Prize for Special Contribution. The deputy secretary of BNU Liu Lixuan read the presentation words for him, and Mr. Liu said that Patrick J.McGovern has donated for a large number of public projects and he has won widely respect for his great love for Chinese culture and what he has done for the international communication of it. The honored guest who presented him the award is Zhai Junjie, a member of Major Revolution and Historical Themes of Film and Television Creation Leadership Team, a committee of National Movie Review Committee, and a committee of PLA Art Steering Committee. And Xiong Xiaoge, Global Vice President and Asian President of IDG, and the founding partner of IDG Capital, accepted the award on behalf of Mr. McGovern. The awarding ceremony culminated in Professor Huang Huilin’s speech. Professor Huang Huilin believed that the international communications of Chinese culture was insufficient in quantity and quality. Torbjörn Loden and Han Meilin had devoted their whole lives for the International Communications of Chinese Culture, whose spirit is very precious. She indicated that “Huilin Prize for Culture” is both a new responsibility and a new starting point for Academy for International Communication of Chinese Culture. She sincerely hoped that this prize may permanently maintain its academic integrity, international outlook and national characteristics, and hoped it would make due contributions to the mutual development of world culture. “Huilin Prize for Culture” will be held once a year, and it will make every effort to promote the international communications of Chinese culture. In 2009, Professor Huang Huilin proposed the idea of “the third pole culture”, which means in accepting the World’s diverse cultural patterns, it classifies the culture of Europe, USA and China as the third pole of world culture according to their influences on the world affairs. Chinese culture plays an irreplaceable role in the world’s more and more diverse culture patterns, and is qualified and possesses the potential to be the third pole besides European culture and American culture. In the past six years, the impact of this theory continued to be expanding, helped to highlight Chinese cultural spirit and enhance Chinese cultural belief, as a result contributing to the formation of “Huilin Prize for Culture”. Nearly 100 distinguished guests have been invited to the awarding ceremony, gathering to witness the first session of “Huilin Prize for Culture”. Mr. Han Meilin is one of the most influential international artists in contemporary China, whose artistic works are of distinctive style and vigorous creativity. As an artist, he incorporates the essence of Chinese traditional art with modern international aesthetic sense in a perfect way, and he is able to use both the Eastern and Western artistic language proficiently. His achievements in the fields of painting, calligraphy, design, sculpture, ceramics and paper-cutting have been proved to be remarkably successful. Mr. Han is also regarded as an important practitioner and promoter for helping contemporary Chinese art reach out to the world, and he has already made outstanding contribution to the international communication of Chinese culture. According to the Selection Regulation for Huilin Prize for Culture, the jury agrees to award Mr. Han Meilin the Huilin Prize for Culture. Mr. Lodén is one of the most representative sinologists in Europe, who has made considerable achievements in the field of Chinese culture translation and research. He keeps adhering to the rigorous and prudent traditional learning method of Europe. His research fields cover the area of ancient Chinese philosophy, Chinese history and culture, and Chinese modern literature. Especially, in his research of Dai Zhen’s philosophy, Mr. Lodén has achieved great success. He has already written and translated books and essays promoting Chinese culture to the world, which amounts to more than two million words. In recent years, he has been dedicated to the translation and publication of The Four Books in Swedish. He has been diligently engaged in the teaching of Chinese culture and Chinese language throughout the year, with students all over the world. Being objective and friendly towards China, he has made outstanding contribution to the international communication of Chinese culture. According to the Selection Regulation for Huilin Prize for Culture, the jury agrees to award Mr. Lodén the Huilin Prize for Culture. Mr. McGovern is the founder for American International Date Group. Since the year 1978, when he first arrived in China, to the year 2014 when he passed away, he has visited China for 130 times. As an Angel Investor, he has invested for numerous Chinese Media and Internet Companies, donating to build three Institutes for Brain Science in Tsinghua University, Peking University and Beijing Normal University, and to build a number of Hope Primary Schools. He is also one of the donors for Chinese Academy of International Communication Culture. As honorary Chairman of the Academy, he has made great contribution to the establishment and development of the Academy. Mr. McGovern’s passion and practice in the international communication for Chinese culture has won him respect of the world. According to the Selection Regulation for Huilin Prize for Culture, the jury agrees to award Mr. McGovern the Prize for Special Contribution.